Marshall Way in an upscale retail area of Old Town Scottsdale, Arizona, is usually a bit sleepy on a Monday afternoon. Marshall Way in an upscale retail area of Old Town Scottsdale, Arizona, is usually a bit sleepy on a Monday afternoon. But this Monday it was packed with spectators who lined up to see the vintage automobiles from the Arizona Concours d’Elegance as they rolled in and parked along the tree-lined street for a free public display. About half of the nearly 100 entries from the Arizona Concours took part in the second annual Arizona Tour d’Elegance on the day following the grand event Sunday at the Arizona Biltmore Resort. The concours is a beautiful affair staged on the landscaped inner lawns of the historic Biltmore, an Art Deco resort that opened in 1929 and remains largely as it was designed by architect Albert Chase McArthur with input from the legendary Frank Lloyd Wright. However, the concours is an exclusive affair, with tickets priced from $80 to $100 each, so hundreds of people jumped at the chance to view many of the rare cars for free, as well as to see them being driven on the street instead of in static display. The Marshall Way event served as a lunch stop for the drivers and passengers and was hosted by Jewelry by Gauthier, with much of the activity happening in front of the store. Owner Scott Gauthier is a collector of vintage automobiles, mostly European sports models, and he had two tiny and unusual cars coachbuilt by Zagato of Italy entered in Sunday’s concours, a 1949 Fiat Topolino Panoramica 750 MM and a 1937 Siata 750 Gran Sport roadster. Earlier Monday, the participants in the Tour d’Elegance visited Gauthier’s car collection in south Scottsdale and then made a long drive into a desert region northeast of the city to Saguaro Lake, one of the scenic reservoirs along the Salt River Valley. Then it was back to Scottsdale for the lunch stop and show, followed by a visit to the landmark home that Frank Lloyd Wright built in Phoenix for his son, David, and his family. One of the most popular attractions during the Marshall Way stop was a machine more than a century old, an 1898 Jeanperrin Voiterette Vis-a-vis driven by owner Alan Travis, accompanied by his wife, Mary, and both dressed in proper period attire. Travis, who has entered antique automobiles in each of the three Arizona Concours, regaled spectators with tales about driving this and his other veteran cars on road rallies and lengthy excursions. 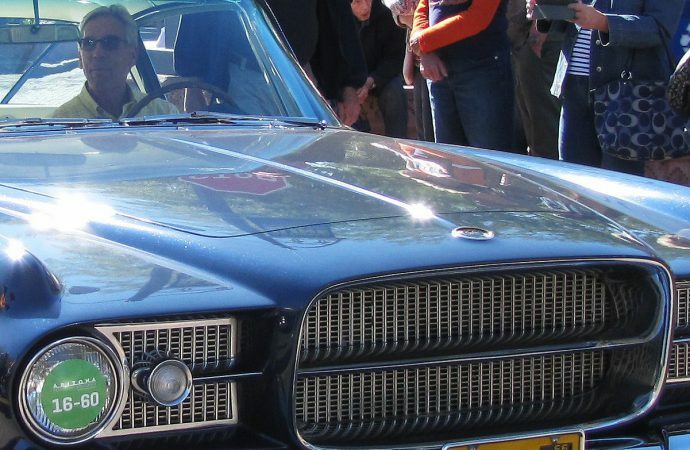 Other vintage attractions on Marshall Way included classic automobiles from Jaguar, Ferrari, MG, Aston Martin, Packard, Oldsmobile, Buick and Cadillac, and an impressive, all-original 1962 Ghia L 6.4 show car that awed viewers with its gorgeous styling. 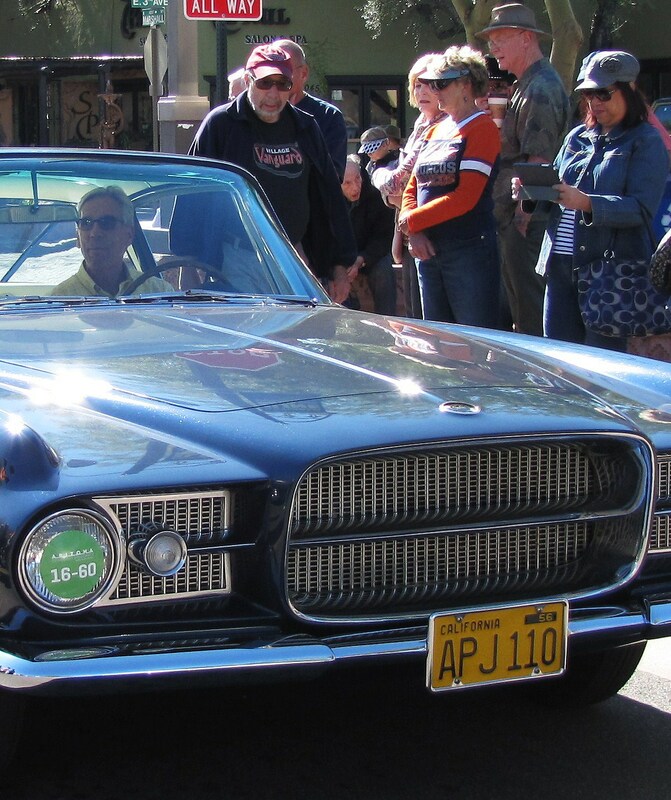 The Arizona Concours and Tour serve as a warm up for Arizona Classic Car Week of collector cars auctions, car shows, parties and other events.